Elementary school gym class is the place of nightmares for many of us – myself included. One memory that stuck with me was the “Presidential Fitness Exam” that we had to take every year. I was a rockstar at the sit and reach (this was before I knew what hypermobility was) and could get by on the shuttle run…but the pull-up test was my nemesis. Then I got really into gymnastics. I was terrible at the uneven bars, but all my hanging paid off. That year, I remember grabbing the bar and effortlessly banging out 4 pull-ups. Victory was (temporarily) mine! As an adult, pull-ups are still my nemesis, in that if practice them regularly I can do them, but once I stop, I lose the skill. Recently, I’ve decided to focus on my pulling strength again. Not just because I like having pull-up bragging rights, but because I’m a MUCH better mover with happier joints when I pull on things. 1. It can reduce neck/shoulder/wrist/elbow discomfort. Did you know that one of the reasons why we might experience upper body joint pain is because we tend to be relatively strong at pushing things and relatively weak at pulling things? Daily life doesn’t give us a lot of opportunities to use our pulling muscles. However, if you make rows, hangs, or pull-ups (modified pull-ups count too, yo!) a regular part of your fitness routine, you can create better muscular balance in the upper body, which for a lot of us means LESS stiffness, tension, and pain. Have you ever noticed that your hands and forearms get tired and sore when you carry things? Before strength training, mine would. When you practice pulling, you increase your tolerance to hold onto things. Short term, this can make hauling stuff in daily life feel easier. Long term, this could equal a better experience in your golden years. If you’re reading this thinking “Uhhh, that’s great, but forget pull-ups. I’m not even sure how to pick up a dumbbell!” I feel you. The weight room can be intimidating. In fact, I avoided it for YEARS, because I was worried about hurting myself… or worse looking inept. However, strength training, pulling exercises, and pull-ups aren’t some mystical thing reserved only for bros and super fit people. They’re just skills. If you practice them, you will get stronger. And if you get stronger, you might realize how many other things that you’re a little unsure about or scared to try are just skills too. That realization is powerful. It makes you feel like almost anything is possible if you decide it’s worth putting in the work. At least that’s what I’ve witnessed in my own fitness and when working with private clients. Aaaa-aaand if you’re wondering what might be a good way to improve your pulling strength or get started strength training, I’ve got your back. My friend Meghan Callaway just launched her Ultimate Pull-Up program and it’s 50% off through this Saturday October 27th. Many people ask me what my strength training routine looks like. Right now, this is it. I’ve been following her program for the past 3 weeks. Here’s what I love about the Ultimate Pull-Up Program. Meghan is super smart and while she’s ridiculously strong, she understands how to build strength at ALL fitness levels. You aren’t going to see any burpee-death-defying-box jumps here. 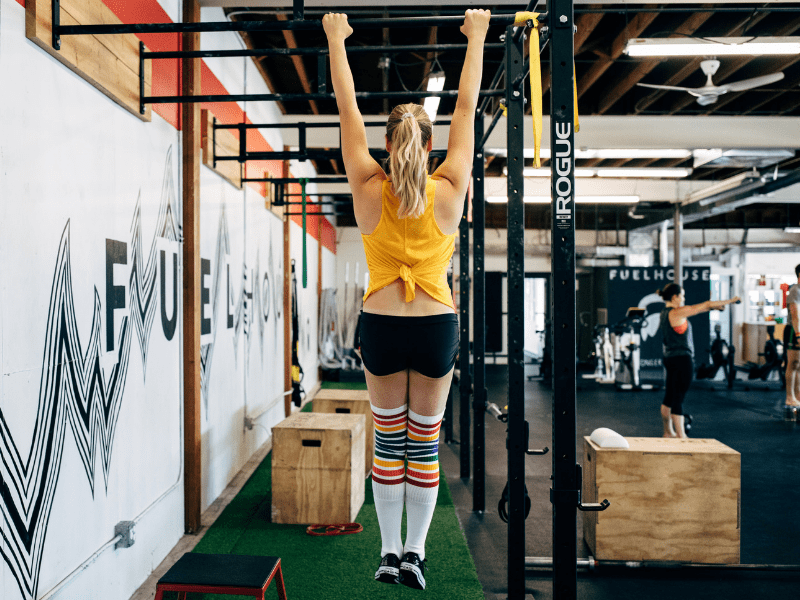 Her program includes a beautiful mix of stability work and strength exercises with tons of options to meet your needs if you’re new to the weight room or have never even tried a pull-up. Her program also more than pull-ups. It’s a comprehensive strength training program, so all the workouts are full body. Improving your pull-up is just the byproduct of smart training and getting stronger overall. Finally, Meghan is an amazing human, so I know if you grab her program and have a question, she’ll go above and beyond to help you. You can get all the details + grab the program here.